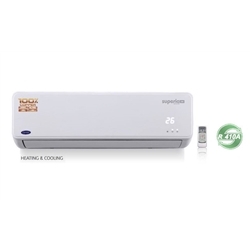 Be comfortable throughout 365 days in a year with Superia Inverter 365 AC. 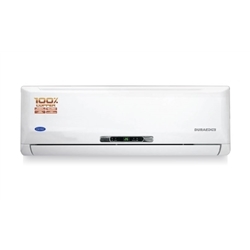 An all weather AC, it not only keeps you cool in summer but also keeps the chill away in winter. Available in three variants, 3 kW (1.0), 5 kW (1.5) and 6 kW (2.0). The temperature sensed by the indoor unit is always diﬀerent from the actual ﬂoor temperature due to diﬀerent installation heights of the indoor unit. This function revises these diﬀerences, ensuring accurate temperature control. With this feature, the unit releases negative ions to disinfect and diminish bad smell in the room. It also gathers house dust, pollen and other micro particles responsible for allergies. These ions, therefore, create a safe and healthy relaxing environment. A combination of Cold Catalyst, Vitamin C and Nano Platinum Filter.Effective in removing tobacco smoke, dust, pollen, mold spores, animal dander and in killing bacteria. Extra sensors built directly into the remote control inform the unit of the temperature even in the farthest parts of the room, thereby ensuring the optimum temperature no matter where you go. The early warning system detects refrigerant leakage and immediately shuts down while simultaneously displaying the relevant error code on the indoor unit display panel. When this function is activated, the unit uses condensed water to remove the dust from the evaporator fins, then switches to fan-only mode to blow away the wet air, thereby removing all traces of bacteria and dust inside. 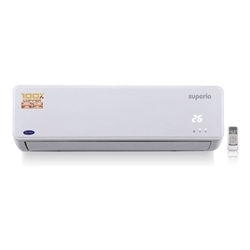 Bring home clean air with Superia 3 Star split AC with features like PM2.5 micron filter which removes the smallest particles and helps provide clean and healthy air for your family. Available in three variants, 3 kW (1.0), 5 kW (1.5) and 6 kW (2.0). This function helps cool the room quickly by continuously operating at the maximum fan speed. In any machine, the regular 'Turbo Mode’ operates for a maximum of 20-30 minutes, whereas the ‘Super Turbo Mode’ runs continuously. For effective cooling during high ambient temperatures, Super Turbo mode is recommended. With Active Carbon and an Electrostatic Fibre Filter, the unit constantly scrubs away smells and poisonous compounds while preventing dust particles and other allergens from entering the air flow system. The Intelligent CRF (Cleaning and Replacement Function) Alert can be used through all seasons to protect your air conditioning unit from damage. If you or someone in your family has allergy problems, keeping your air ﬁlter clean and replaced on timely basis can reduce the risk of triggering an allergy attack on any given day. 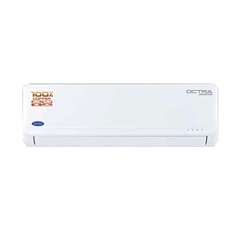 Fitted with cutting edge inverter technology, the Octra Inverter AC cuts your energy bills significantly by adjusting compressor speed based on the requirement of the room it is cooling. Available in three variants, 3 kW (1.0), 5 kW (1.5) and 6 kW (2.0). Minimising exposure to formaldehydes is a significant consideration for human health and well-being. This filter is multifaceted in its capability of removing the same along with VOCs, chemicals and vapours with a specialised blend of oxidizing agents. Releases all negative ions to disinfect and diminish bad smell in the room, thereby helping you breathe clean and pure air. The unit has an instant recall function which adjusts the horizontal louvers to their most recent position. To prevent the breeding of bacteria inside the unit, this function ensures that there is no dust or water retained inside the unit. The unit first uses condensed water to remove the dust from the evaporator fins, and then it switches to fan-only mode to blow away the wet air. This whole process disinfects the indoor unit and ensures that all traces of bacteria are removed. Bring home clean air with Duraedge 5 star split AC with features like PM2.5 micron filter which removes the smallest particles and helps provide clean and healthy air for your family. Available in three variants, 3 kW (1.0), 5 kW (1.5) and 6 kW (2.0). If the unit malfunctions for any reason, it will shut oﬀ automatically while indicating the relevant error code on the indoor unit, enabling fast servicing. The early warning system detects refrigerant leakage and immediately shuts down while simultaneously displaying the relevant error code on the indoor unit display panel.Bring home clean air with Duraedge 5 star split AC with features like PM2.5 micron filter which removes the smallest particles and helps provide clean and healthy air for your family. Available in three variants, 3 kW (1.0), 5 kW (1.5) and 6 kW (2.0). CARBON FIBRE FILTER With Active Carbon and an Electrostatic Fibre Filter, the unit constantly scrubs away smells and poisonous compounds while preventing dust particles and other allergens from entering the air flow system AUTO DETECTOR If the unit malfunctions for any reason, it will shut oﬀ automatically while indicating the relevant error code on the indoor unit, enabling fast servicing. NEXGEN DEHUMIDIFIER Mould and mildew are types of fungi which can thrive in humid areas and can pose numerous health risks. The NeXGen Dehumidiﬁer allows the air conditioner to reduce the humidity of a speciﬁc room whilst retaining its cooling capability, keeping the room at a comfortable temperature REFRIGERANT LEAKAGE DETECTOR The early warning system detects refrigerant leakage and immediately shuts down while simultaneously displaying the relevant error code on the indoor unit display panel.